The emerging leaves on the Golden Rain Tree are pink-red then mid-green then turning butter yellow in the autumn. Small yellow flowers form large pyramidal panicles that resemble paper lanterns mid – late summer followed by pink or red-flushed fruit capsules. 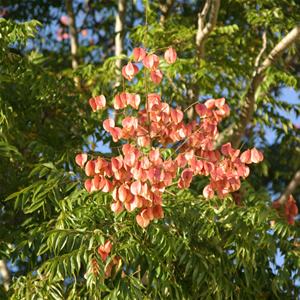 The Golden Rain Tree is an open-branched deciduous tree which reaches a height and width of up to 40 feet. Koelreuteria paniculata takes the cold, heat, drought and wind well. May need pruning to help keep shape.